Tiffany Rider has over 15 years of experience focusing on criminal antitrust cartel investigations; follow-on antitrust class action litigation and arbitration; and complex mergers and acquisitions. 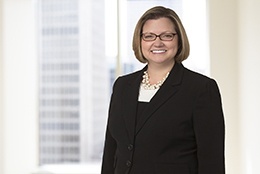 Regarded as a prominent antitrust advisor, Tiffany has been named by Chambers USA among "America’s Leading Lawyers for Business 2018" and in Legal 500 U.S. Tiffany has defended companies and individuals in consequential international cartel cases, advocating before the Department of Justice, European Commission and Canadian Competition Bureau, among a number of other global enforcement agencies. She also has extensive experience in civil follow-on MDLs, civil litigation and arbitration. In her counseling and compliance practice, she designs and implements global competition compliance programs for clients in diverse industries, including technology, manufacturing, transportation and financial services. Additionally, Tiffany has extensive experience representing clients on significant mergers and acquisitions, including before both the Department of Justice and Federal Trade Commission. Tiffany is a frequent speaker on panels regarding international competition developments, including follow-on European litigation. She has held key ABA leadership roles as a Chair of the Civil Practice and Procedure Committee and now as a member of the International Cartel Task Force. Prior to joining Axinn, Tiffany practiced in the antitrust department of a large, global law firm. Represented Corning Incorporated in the auto part criminal investigation and follow-on civil MDL. Represented Horizon Lines in the cabotage shipping criminal investigation and follow-on civil MDL, as well as its transactions valued at $610 million with Pasha and Matson. Represented EQT Corporation in its $720 million sales of its natural gas distribution business to Peoples Natural Gas. Represented Sprint in its opposition to AT&T’s proposed acquisition of T-Mobile. This case was recognized in the 2012 Financial Times “US Innovative Lawyers” report. Represented BHP Billiton in its proposed $150 billion acquisition of Rio Tinto (received Department of Justice clearance). Named in Legal 500 U.S.
FTAIA Update: How Direct is "Direct?" 2011 Year-End Review of FTAIA Cases: Is the Pendulum Swinging Back Towards the Plaintiffs?